I think this is valuable feedback. As you've noticed, we've created several different types and styles of trailers. Knowing how people feel about it is good for us, so thanks for sharing. I'm going to make a stake for "Not the whole thing" trailers, though. How many times have you seen a movie trailer for a comedy, and all the best jokes are in the trailer? Every. Single. One. When that happens, by the time I see the movie and I feel let down because I knew exactly what is coming, what the payoff is for every joke setup. Granted, GW2 isn't exactly the stuff of comedy but I still like a trailer that more suggests than tells me everything. But hey, that's a personal opinion, and we appreciate hearing yours. I don't get the people that want trailers to tell us everything. I freaking hate that when movies do it, I don't want my games to do it too. This snippets that the trailer did give us already has me interested. I honestly got frustrated that being Aurene's scion was a sub-plot thing. We've really done little to nothing with her. It's about time we do. The only thing that has be a bit worried is the upgradable armor. I'd like more info on that as I've slowly been getting interested in doing more content and do not like the idea of having a WoW gear system where my gear becomes total kitten each release. Not looking forward to that at all. Now if this armor is similar to heirlooms that scale with you as you level to make leveling easier? I wouldn't mind that. I'm curious about the new Mastery as well. I've used the other one (share health with mount) quite a few times so to me it's useful, so I wonder how this one will work out. Aside from a new map and a story episode, is there anything else we should expect in the upcoming release? I'm calling it. Aurene starts to speak in this. I'm also hoping that the refuge gets updates from the current events team constantly. Hi. If you view the trailer, at the very end there's an "end slate" that shows what's coming. It's more than you listed, for sure! i hope the armor will work like the adaptable armor of SWTOR, add upgrades and mold it to your own will. anet is best in the industry why do they get so much undeserved kitten from you people? What makes you so entitled? No worries. I like the fact there's a list, but it's could be sort of easy to miss, since it comes later in the video. Oh yes, good point. A full asset kit of screenshots can be found linked in the blog post! The actual content to be released may very well be good, but I think it's fine to express an opinion of finding the trailer underwhelming if you found it underwhelming. The trailer wasn’t exciting for sure but I’m still glad we got one. I am loving all the breakdowns though. The multiple kind of bullet points with links to screenshots and pictures. I hope they keep some aspects of this format for future releases. The new raid wing looks like it will be stunning! I’m just hoping there isn’t a 250 mystic coin entry fee! This completely made my week! Super excited, can't wait to experience it. 40? For the boosts I am guessing? I go in with 11 (which I already have). Ten for the node and 1 for the scroll. I only buy the boosts after I get a look at the map and decide if I will be there enough to make it worthwhile. Hopefully the medium armor set has a proper split this time. Oh, what am I going to do with you!? The upgradeable armour sounds interesting - is this already a thing or new concept? I want to see SOME things in a trailer but yeah, not everything. Finding the balance is a bit tricky though. I am a bit concerned about the armor too. According to the blog the collection starts after the story so hopefully it does not become OP to have it since not everyone completes every chapter. Bug in the system was the best trailer. The whole thing, the bit of humour turning dark with the re make of fear not this night really made me excited for it. I watched this trailer thinking meh really. But I love Aurene and gutted the leggie wasn't a bow. I'm guessing that the upgradable armor means it'll be like WvW armor there are 3 tiers of wvw armor lvl 1 is from reward trek, lvl 2 is from vendor after lvl 1 has been done, lvl 3 unlocks with having lvl 2 done and having the proper rank. As far as how it'll upgrade I'd assume we'll be given rare armor upgrade it to exotic then finally upgrade it to ascended. That way they can introduce 9 new armor skins without having to do a ton of work. Agreed with you Dami, the "A bug in the system" trailer was clear and efficient giving me shivers but also making me curious about the map, also you find all the things you saw in the trailer story step after story step which is great. Really felt like the place is twisted/invaded, here in the last trailer I only feel like "Meh another branded maps with crystals.."
She's been using griffon animations ever since her new model was introduced at the start of the season. I think it is because she uses the same model as the griffon and I'm really hoping we do get to ride her eventually (in a story instance), but that's not a new development. I just assumed it was either a purely cosmetic upgrade or like the upgradable items we've got now, like Mawdrey where it starts off as exotic with fixed stats and can be upgraded to ascended infused with selectable stats. Has anyone downloaded the images from the blog? I wanted to peek but it was a zip file and I had no idea what software to tell Windows to use to open it (my guess of Media Player was a failure). I'd love to see more screenshots. I usually use 7-zip to uncompress zip files, in windows though you should be able to right click and uncompress the file. You can download Winzip for free. There's other free programs which can unpack zip files too, but I can't remember what they're called. Looks like that shatterer has a cousin. I'm guessing the green is like when the destroyers had zaitan's magic? I love that the trailer was rather vague. I like to be surprised with "things" that are merely hinted. It may be that if Kralk and Aurene are "talking" to each other, then I can kind of see where we'll spend a lot of this episode trying to guide Aurene between truth and Kralk's propaganda (hence the "star to guide us" title) and maybe even riding her as part of the story. It intrigues me that it said Aurene could REPLACE Kralk. 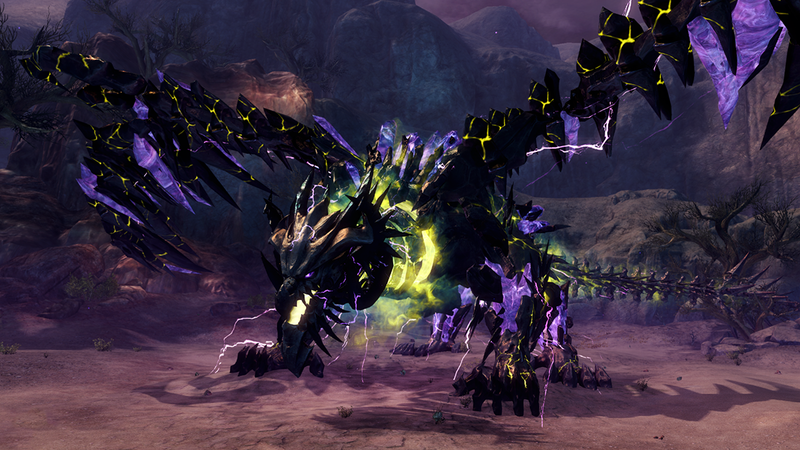 Maybe that's the key to saving the world... have Aurene become the all-powerful protector Dragon God of Tyria by absorbing the rest of the Elder Dragon energy... Ok, I know that's a stretch, but it's a fun idea... I just don't want Season 4 to end on a meh note. Weve known that Aurene could replace Kralk since about midway through PoF, that was the whole point of Glints children, so thats not much of a surprise unless you havent done PoF. I have, but I had forgotten it until they deliberately made mention of it in the trailer... which made me imagine a number of scenarios. Aurene can destroy and replace Kralkatorrik it says. Guess we have another dragon to slay after all. And moar branded. To be honest, I appreciate that it's coming out next week but it feels very been there, done that and I really hope we can leave the branded theme behind us soon. So I'll be hoping that we can get it over with this episode right away. That'd be nice. I'm sure the raiders will be happy to get another raid, so that's cool for them. A new legendary item for the most devoted farmers but of course it will still require a gift of war and battle so lots of sPvP and WvW still needed, so that's not for me. And well speaking of sPvP and WvW, it seems that they have nothing particular to look forward to, but then there are contradictory messages on how many people do that still, so I'm not sure if that's a big deal or not. But the upgradeable stuff sounds interesting. The gear and the base. So I'll be looking forward to seeing if that's something I want to get involved with. And I guess it will be a new daily zone, so I'll be interested what new stuff happens there as well. Just really hope we can soon wrap up season 4 and get into something actually new. I mean we went from Risen to Awakened and from one Dragon to the next and more branded stuff that keeps coming back as part of the theme. And well, I'll be interested to see how literal the title is for the trailer. That could be a satisfactory conclusion to the dragon saga. Maybe we'll also find out why the human gods just decided to up and leave. Cause aside from their in-game explanation there has to be a reason why the writers decided to pull them out of the picture entirely now. So ok, it's another Dragon but perhaps there will be some interesting story twists or revelations that could yet be interesting. That's sort of what goes through my mind now that I've seen the trailer. I do hope to be able to pull some things from LS4.4 that I can enjoy. The branded are cool imo, i just want to move away from desert map after desert map after desert map, can we go back to ls3's variety soon please? I have no enthusiasm for new maps because it's just another desert. Looks like that shatterer has a cousin. I'm guessing like when the destroyers had zaitan's magic? Either vine or death magic. Maybe both? Or something else. Kralk did absorb Balth’s magic afterall. what is anticlimatic about it? I released it (a day later than usual) on all the usual platforms? Where did you expect the announcement apart from the places where it always is? Trailer is pretty underwhelming. The last two were much better, they showed some content from the Episode while also playing with characters and the visuals a bit. The trailer to " A Bug in the System " was a real step up from what we had before and the trailer to " Long live the Lich " improved on that. The trailer now is a step backwards. I know you want to surprise people but if you have new content you need to show some of it. So we get a new raid. About time, but there was no emphasis on it at all not even the first boss doing some shenanigans to kill the raid. And also the rest of the content that gets implemented like Sun's Refuge., just a small text at the end and no ingame footage. Like it would be just a small bugfix. That image is labeled "MythwrightGambit 03" in the zip file, so I think it's from the new raid wing rather than the Sun's Refuge instance. But perhaps that's a clue that we'll be able to use our spare mini Jennahs in the forge soon? I like to give some feedback also and have to admit that indeed, the last trailer did nice on showing the new fractal, new mount and legendary. it was a very good hype for us. Even if you only gave us only 2-3 secs of Xiuquatl, suns refuge and Mythwright Gambit like you did with the bug in the system trailer would be nice. I really like how this trailer starts with a flashback and builds up the story from where we ended. I'm really curious about the new content, especially the suns refuge, great job devs! I'm excited! I completely agree with you! I loved this trailer because of that. And also I think the designers wanted to give such peaceful, heartwarming trailer, but just to give more spice in the actual episode. I personally think: "A Calm Before the Brandstorm" would fit better. Well, when you don't hype it at all, then everything is a pleasant surprise. After all the is a start/set up of a semi-new plot, I wouldn't expect any major reveal or showdown. I think most people were looking forward the trailer on Tuesday at around gem store update time. After I lost hope for the trailer release during this week, it arrived in form of "some article on the internet with trailer in it". OMG we will finally know what Zommoros is doing in the mystic forge. That is some unexpected raid content. I liked the trailer. It was not generic over-the-top. It made me curious what will happen with aurene. This trailer was more focused on story, then features. You got it backwards, the snake trows scepters. Finally a scepter I'm looking forward to build and own, and with the summoned snake that follows and help you. This is quite an innovation in legendary weapon making. Now please, give Scepters to ranger class with its new elite spec, this new weapon would be perfect for my ranger.